Intellectual Property simplifies the process of attaching a dollar amount to intellectual property and intangible assets, be it for licensing, mergers and acquisitions, loan collateral, investment purposes, and determining infringement damages. 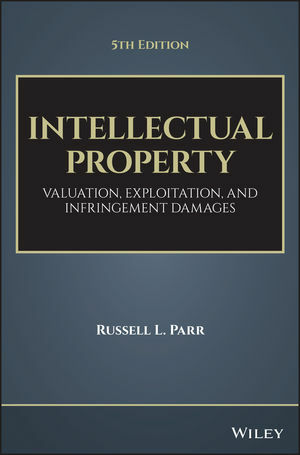 Written by Russell L. Parr, an expert in the valuation/intellectual property field, this book comprehensively addresses IP Valuation, the Exploitation Strategies of Licensing and Joint Ventures, and determination of Infringement Damages. The author explains commonly used strategies for determining the value of intellectual property, as well as methods used to set royalty rates based on investment rates of returns. This book examines the business economics of strategies involving intellectual property licensing and joint ventures, provides analytical models that can be used to determine reasonable royalty rates for licensing and for determining fair equity splits in joint venture arrangements. Key concepts in this book are brought to life by presenting real-world examples of exploitation strategies being used by major corporations. Provides a detailed discussion about determining intellectual property infringement damages focusing on lost profits and reasonable royalties. RUSSELL L. PARR, CFA, ASA, is President of Intellectual Property Research Associates (www.ipresearch.com). He is an expert in determining the value of intellectual property. Mr. Parr's books about intellectual property value and management are published in Japanese, Korean, Italian, and English. He is dedicated to the development of comprehensive methods for accurately defining the value of intellectual property.